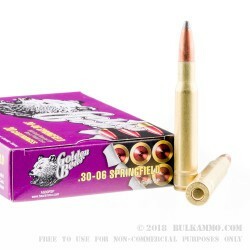 A significant rifle round for those who hate paying more than a dollar a shot for the .30-06 Springfield, this is a very good example of why cheap steel can make sense for many use cases. 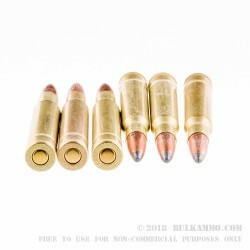 This is a brass coated steel cased cartridge that is manufactured for optimum performance out of the popular .30-06 caliber. 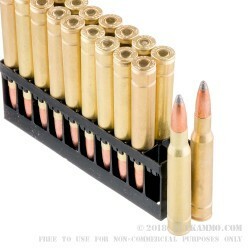 The case design features a circumferential band that increases flexibility of the steel without significantly weakening the shell and allows the shooter to maintain confidence in the load’s ability to deliver reliability while drastically reducing torn case heads, or case head separation. The aggressive action of semi auto .30-06’s and the violent extraction of the same, means that historically steel has been a tough material to get reliable performance out of on most of the very popular guns, the M1 Garand included. This Russian made variant while non-reloadable, offers fantastic value for money for those types of shooters, but can also be used well in bolt action rifles too. 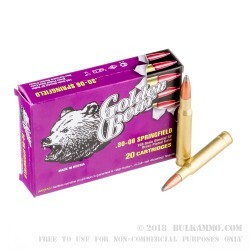 The 168 grain soft point projectile is a very nice bullet on bigger game and does not suffer much in terms of long-range accuracy, despite the reduced bullet coefficient.